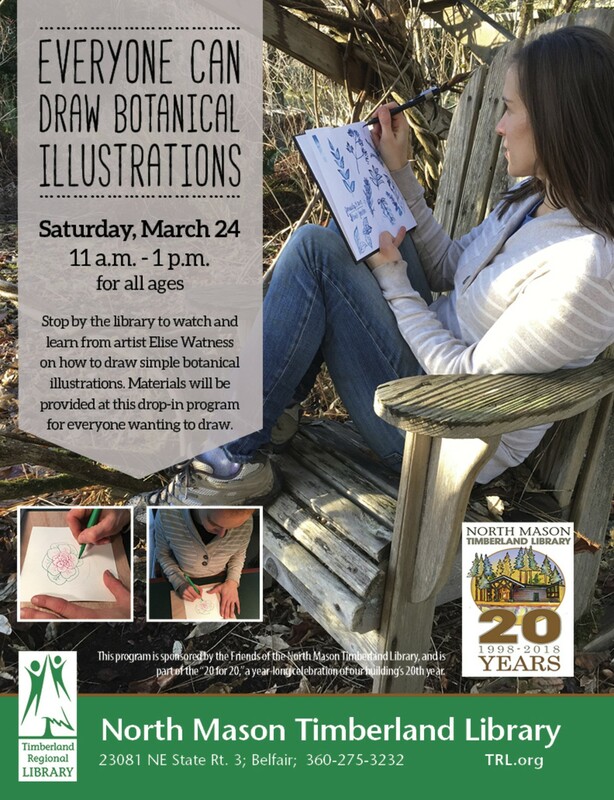 Everyone is invited to stop by the Discovery Zone at the North Mason Timberland Library between 11 a.m. and 1 p.m. Saturday to watch and learn from local artist Elise Watness on how to draw simple botanical illustrations. Discover how to get comfortable drawing simple, natural shapes that become lovely botanical art! Watness will break down botanical line drawing into simple marks using pencils and erasers on paper. Materials will be provided at this drop-in program for everyone wanting to draw. Wood panel guides and live plants will be used as models. This special event is sponsored Friends of the North Mason Timberland Library, and is part of “20 for 20,” a year-long celebration of our building’s 20th year. Friends of the North Mason Timberland Library invites you to learn more about how Friend Groups support and promote public libraries at TRL.org/Get Involved.